Simnet Uninstaller is an easy-to-use and absolutely free uninstaller manager to manage installed applications. Every application installed on your computer decreases the free hard disk space and reduces system's performance. Simnet Uninstaller lets you decide easily to uninstall applications which you use seldom or which requires too much disk space. Rbemoves applications completely without leaving any trace. Fixes invalid installation entries. Uninstaller - Uninstall programs from your system and increase free disk space. * Rbemoves applications completely without leaving any trace. * Fixes invalid installation entries. * Smart and easy-to-use interface. * Minimal installation, low memory and cpu usage. Qweas is providing links to Simnet UnInstaller 2010 2.1.1.0 as a courtesy, and makes no representations regarding Simnet UnInstaller 2010 or any other applications or any information related thereto. Any questions, complaints or claims regarding this application Simnet UnInstaller 2010 2.1.1.0 must be directed to the appropriate software vendor. 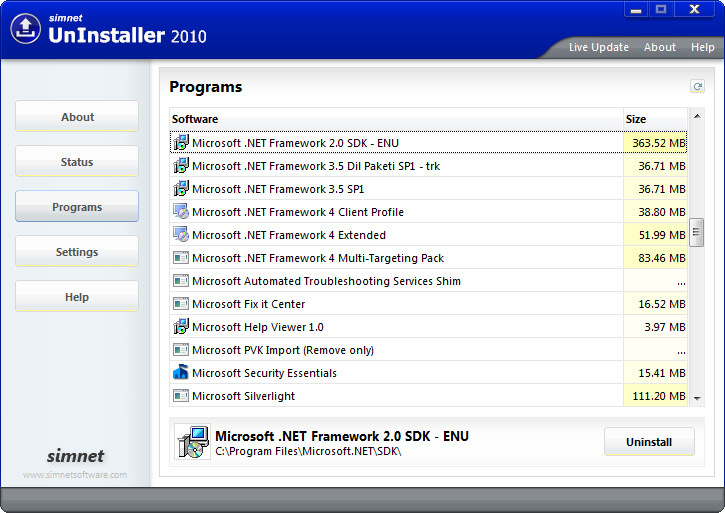 You may click the publisher link of Simnet UnInstaller 2010 on the top of this page to get more details about the vendor.